Horse Tack, Supplies & Accessories | R.E. Fennell Co., Inc.
Fennell’s . . . 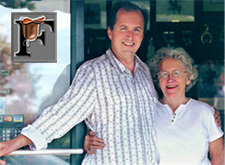 Since 1909 . . . A 100 year family tradition of serving your leather and equine needs. We’re All About Friendly Customer Service. Whether you have sales or a return inquiry or you just want to place your order over the phone, we’re here to help. Horse equipment, Personalized Leather Goods, Stable Needs. We stock a wide range of equipment and supplies from leading industry brands. We also make some of the finest leather goods at honest, direct-to-consumer prices right here in our shop. Our store is located at the Red Mile Harness Track. Whether you are in town for the Junior League Horse Show or the Fall Grand Circuit Race Meet, we are a short walk away. If you're in Lexington for an event at the KY Horse Park or one of the many yearling horse sales around town, you'll find Fennell's centrally located and a must-see part of your visit to Lexington.